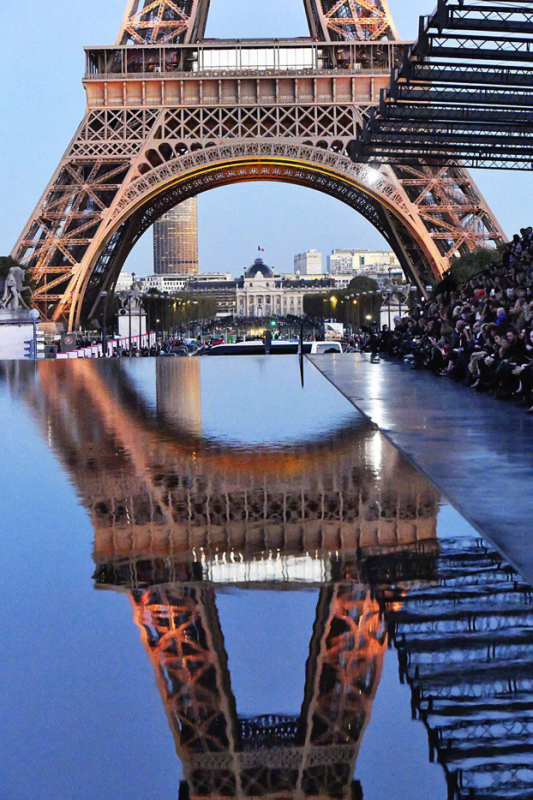 September may mark la fin of summer, but it welcomes the last of the fashion shows – Bienvenue Paris Fashion Week. 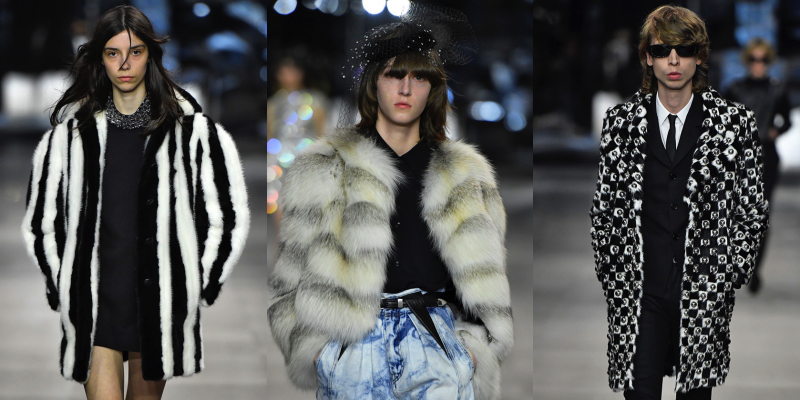 Saint Laurent kick-started Paris Fashion Week SS19 in sensational style – opposite the Eiffel Tower, with the shining lights glimmering over the models strutting down the ‘walking-on-water’ runway. 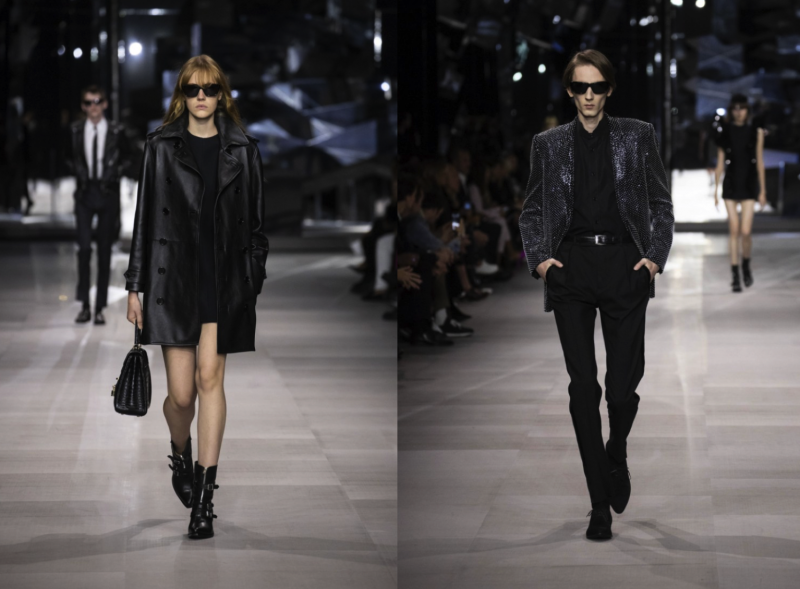 The SS19 Saint Laurent collection fits exactly what Anthony Vaccarello is about – ultra-high, visuals on show, and, the colour black. Sticking to his forte, leather and snakeskin came in forms of pants/shorts, aesthetically showing off a considerable amount of ‘leg’ whereas lace and velvet came in the blackest form to create sheer pieces, high-waisted trousers, dresses, blazers, playsuits and swimsuits – all emphasising the femininity that Vaccarello is famously known for – in this collection. Amongst the magical setting, models strutted their stuff, whilst watching on the sideline were famous faces such as Nicole Richie, Lindsay Lohan, Kate Moss, Rosie Huntington-Whiteley, Cindy Crawford, and Charlotte Gainsbour. The swimsuits, and sheer tops facilitated what has been popular this season – the Saint Laurent collection adhered to what women wanted, and complied the beach to nightwear look. The fur embellished coat reflected the lights from the Eiffel Tower, gleaming at its full force. The gold-finished fur took on a metallic guise, adding to the majestic ambiance on the runway, adding a splash of colour, which has been the common theme within NYFW and MFW SS19 – fur juxtaposing monochromatic colours. 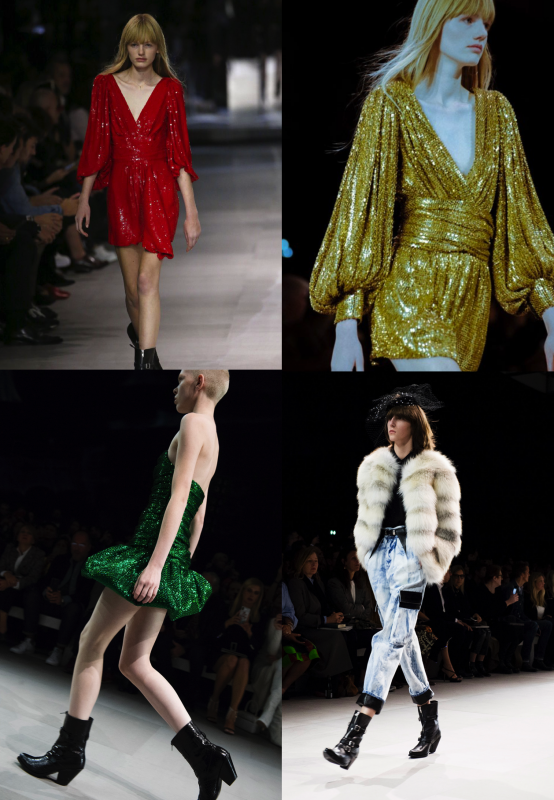 However, colour in this collection had been apparent, with sequins and red, blue and gold shades being popular. Vaccarello also bought a rock and roll vibe, providing an edgier stance on the runway with head bands, mini belts as headbands and hats to round-up the PFW SS19 collection. Following YSL, Celine also used fur embellished pieces in their SS19 collection. 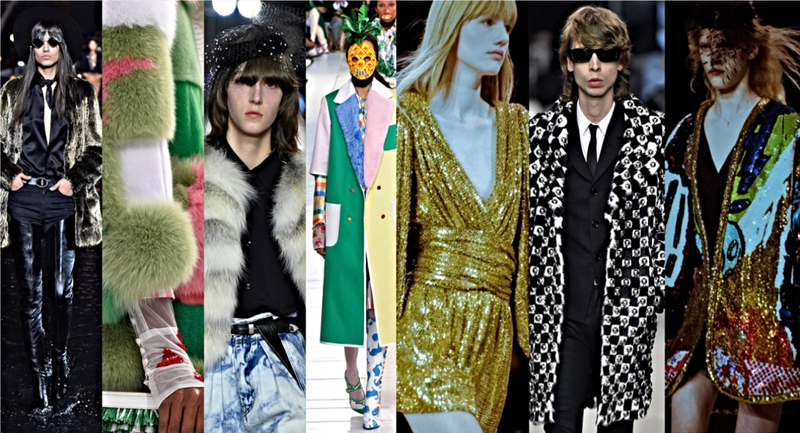 Monochromatic tones dominated the runway (as it seems so this SS19), and new designer, Hedi Slimane stuck to what he knew – with swanky pieces, party-accustomed, and suited designs in the new collection. The collection, which included both womenswear and menswear, featured a set of three fur coats, mini dresses, leather, and sequin-orientated pieces, much to viewers surprise – a YSL ‘replica’ look. With Slimane, came new rules. Phoebe Philo bought Celine into a driving force, with designs epitomising powerful and successful women. However, Slimane went to the contrary, and gave Celine a new way of living – partying all night long, with a more youthful group. This new look took on a different vision of Celine, whose primary message was the ‘masculine to feminine’ theme. The first model that walked down the runway summed up what Slimane is all about, and the route that the new Celine collection went towards – the colour black, short and slim designs. The polka dot mini-dress, along with the other short pieces, sequins, veils and ruffles (all which took on an iconic French style) and black suits, subjugated the runway, and were what drove the new collection, amongst the famous Lady Gaga, who was sat on the sideline, with the new Celine bag. The menswear went through the same transition, keeping similarities within Slimane’s previous designs, the skinny suit, leather, and the foremost colour, black. Although black was, as most commonly, the colour that drove the collection, there were sploshes of red, green and gold that gave a break in-between an array of similar looks to disrupt the sequence. 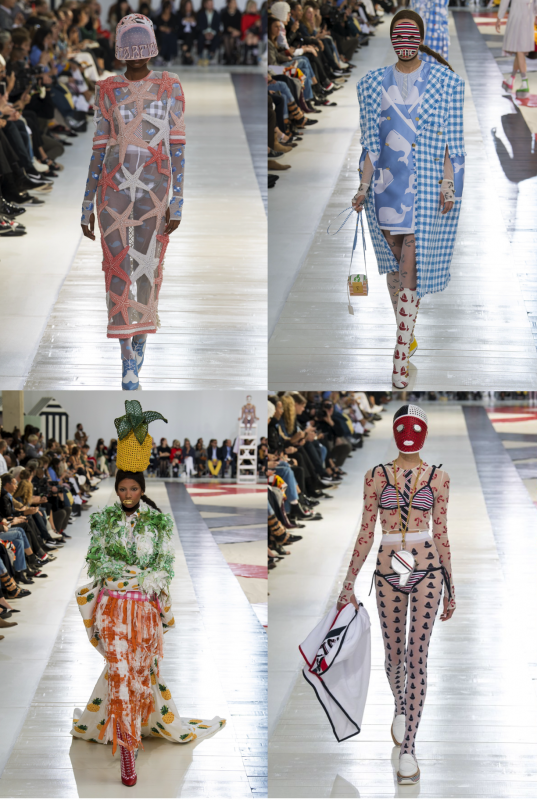 Thom Browne’s SS19 collection was a mixture of vivacious colours and fragments of summer, ranging from a beach ‘vibe’ (fruit as accessories), to masks, as part of the look. These references came down to the creativity of Browne, and his distinctive, peculiar, and fascinating imagination. In his world, anything is possible, and he has created something extraordinary for his SS19 collection. Thom’s SS19 collection featured a mixture of entertaining silhouettes and a series of different materials to create something extravagant. Colour scheme had no limit in this collection, as vivid and attention-grabbing colours were used, on top of the already-outstanding-collection. What hadn’t gone unnoticed was the jellyfish ‘character’, the masks on the faces, the sewn lips, the fur trimmed collar, the fur detail, and of course, half a fur coat. Fruit prints were used significantly in this collection, and were used in a variety of different ways. 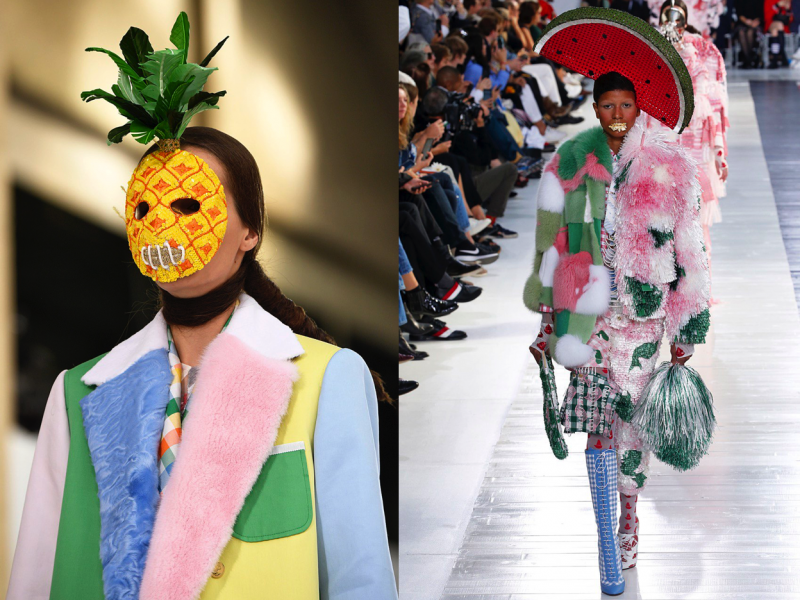 The beach ‘vibe’ derived with fruit being used as masks for the models, but also on the clothes, as accessories, as well as on top of the model’s heads. These influences, where face masks paired with perfectly made jackets, combined flawless clothing with elements of surrealism. Thom created a collection based on liberty and creativity – and explored a different way to incorporate the everyday, into fashion. Paris Fashion Week SS19 may be over, but it only means that AW19 is ready to take us by storm in full force – and we cannot wait to see all the warm, cosy furry winter looks it will bring.